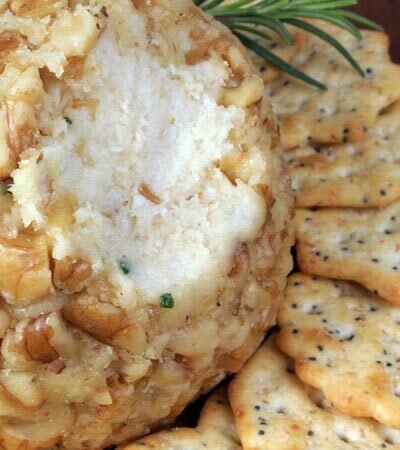 My goal was to make a vegan "cheese" ball that contained no hydrogenated oils or isolated soy protein. After many months of experimentation, it's finally done! The blended almonds, tofu and pine nuts create a velvety texture and taste that closely resembles that of real cream cheese. It was hard to get a mix of ingredients that would form a ball but also taste good. What amazed me was that it actually wound up tasting better than the real thing! 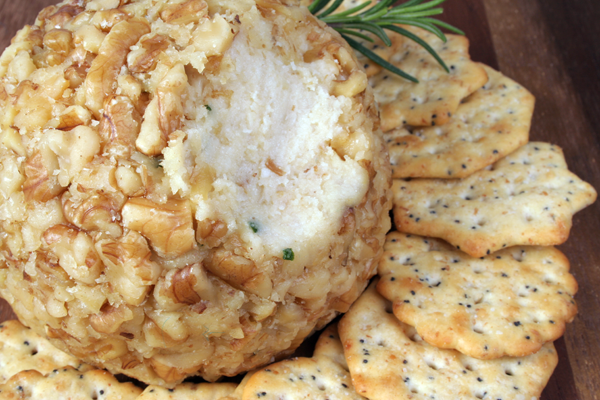 Making a cheese ball has always been a favorite tradition of mine during the holidays and I'm so happy that I've converted that tradition into something vegan and healthy. The best thing about this recipe is that you don't even have to turn on the stove! Want to know what others thought about this recipe? Would you like to comment on this recipe? Go to the Vegan "Cheese" Ball, Original blog entry. Place almonds and pine nuts into a food processor with the salt and sugar and blend until it's ground up for about 2 minutes or until clumps start to form. Measure 1/3 of a block of tofu from a 14oz block. It's important to use firm tofu. Silken or extra firm will not work. An average block of tofu is about 4.5 inches long, so measure 1.5 inches off. Drain tofu in a strainer by smashing and pressing firmly. Using a clean dish towel to soak up some of the water helps too. It's important to get as much water as you can out. Now add the tofu to the almond and pine nut paste that's already in the food processor along with the red wine vinegar, lemon juice, canola oil and onion powder and blend about 2 minutes. Mixture should resemble extra thick mashed potatoes. Remove the blade from the processor and with a spoon mix in chives. Spray a bowl and a square of plastic wrap with no stick spray. Pile mixture into the bowl and cover with plastic wrap. Place in fridge and Let this chill for at least 5 hours or overnight. It will get very firm and can now be shaped into a ball and rolled in chopped walnuts to coat. If you lightly oil your hands it will keep it from sticking to your hands while you roll. Now it's ready to be served with your favorite crackers. Coat with pine nuts or walnuts. Coat with pecans that have been lightly coated with maple syrup and toasted until crispy on a cookie sheet sprayed with non stick spray in a 200 degree oven.